Two days ago, another radical democrat/liberal bullied and physically attacked someone that doesn’t look, act, and think just like him. The man was seen taking a kids MAGA hat and then throwing a drink on him. “You ain’t supporting s*it n******… ” the video shows the man saying after he tossed his drink on the teenager. “This is gonna go right in my f**king fireplace, b*tch,” he said, waving the hat as he walked away. People like this thug are why Democrats keep losing elections. They are radical and out of control. Luckily, the Scum BAG was ID’d as Kino Ahuitzotl Jimenez! And what is even better he was fired from his job, his family was informed. He had to delete his social media, and he is looking at jail time. 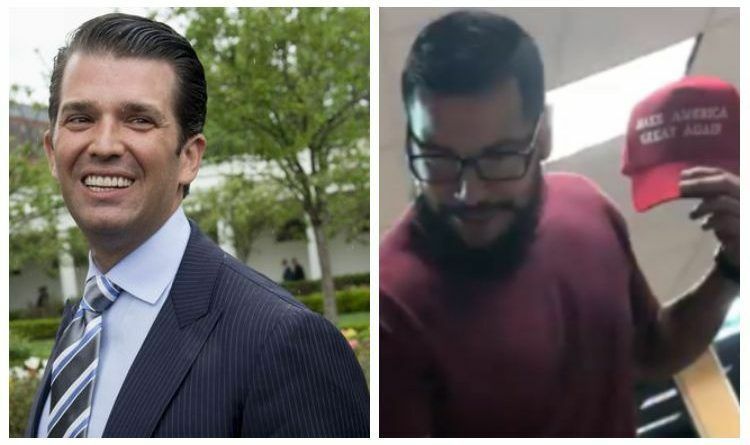 Ths video also caught the attention of Donald Trump Jr. Thursday afternoon when he tweeted his disgust over the assault of a young teen. “This is disgusting and a disgrace. No one should feel unsafe supporting their President @realDonaldTrump or #MAGA agenda. Imagine someone did this to an Obama supporter?!? !” tweeted Don Jr.
Later Thursday evening, Don Jr. offered the teenager a new MAGA hat, signed by President Trump! Don Jr. tweeted: If someone can get me this young man’s information I’ll get him a new #maga hat… SIGNED by #potus!!! I’m very close to the point where I can no longer have any regard for leftists as human beings. They sure don’t make it easy. It’s a worry to think many with opposing views have such low emotional intelligence that they resort to assault, theft, offensive abuse. And these are supposed to be the mindsets who preach ‘ love trumps hate and inclusive tolerant living. In reality, they’re very dangerous to public spaces and communities, demonstrating they’re incapable of functioning in a diverse, Multipolar Society. Share this news so that this brave boy can get his well deserved reward!